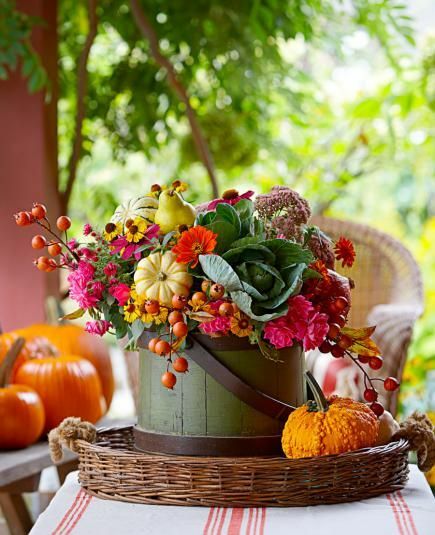 Weight a pot with stones and fill with florist’s foam to secure the branch, then wrap the pot in a drawstring jute bag. 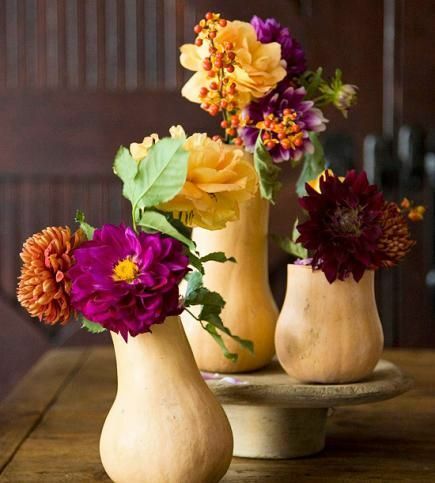 Pair the arrangement with flowers and plants in leaf-inspired colors—we used roses, millet, kale, leaves and berries. 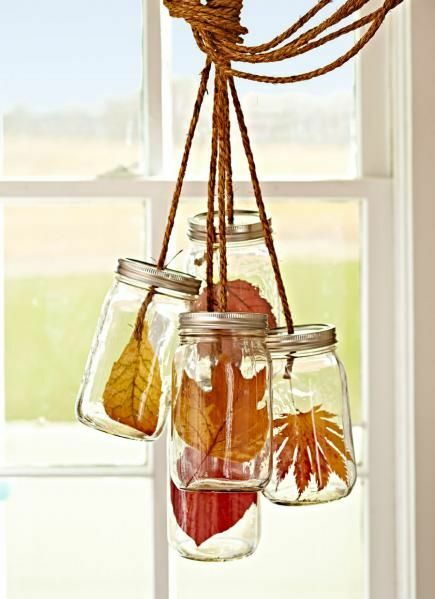 To hang each gourd, drill a small hole through the top of the neck and thread florist’s wire through it. Finish your display with dried vines, bittersweet berries and maybe even an abandoned paper-wasp nest. 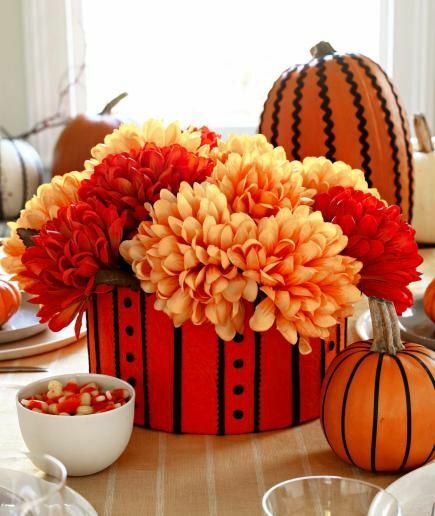 Vibrant dahlias in carved-out mini pumpkins delight at place settings. We used a candle carver—a small tool that removes candle-size chunks from fruits and veggies. 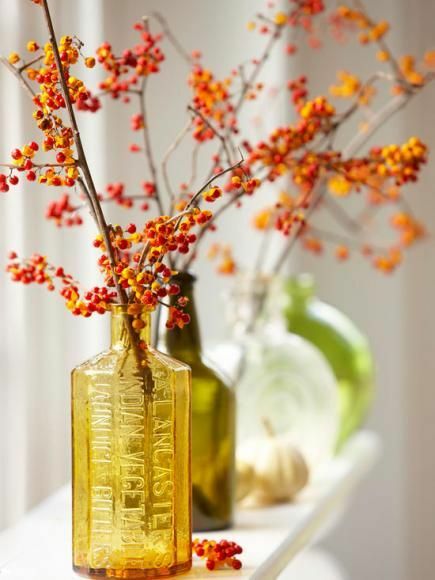 Insert a votive holder as the “vase” for water and blooms. 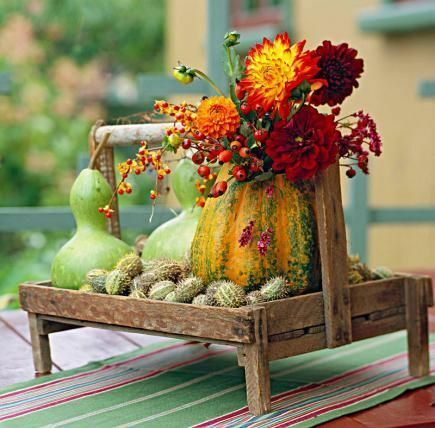 A swan gourd makes a natural vase hanging from a front gate or porch railing. 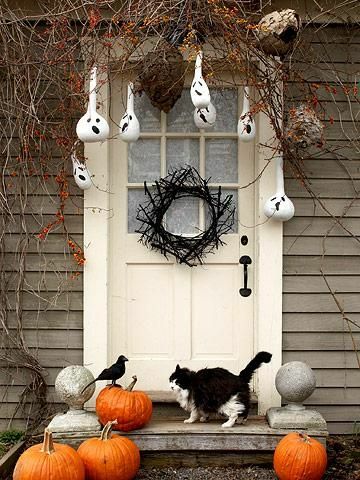 Cut a hole near the gourd’s neck, then hollow out enough space for fall flowers: mums, black-eyed Susans, Virginia creeper or other favorites. 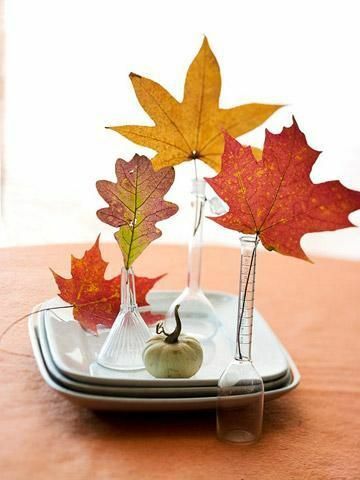 While the trees may be dropping leaves outdoors, you can preserve them inside on this tree — perfect for an entry display or party centerpiece. 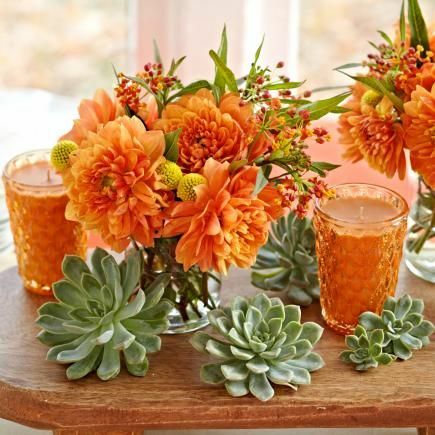 Create an eye-catching fall centerpiece with candles, succulents and fresh flowers—we used dahlias and billy buttons. Mimic a blazing sunburst with this fall wreath. Fold out the husks on ears of Indian corn so they point straight out from the tops. Hot-glue the ears to a straw wreath, and “fluff” the husks to complete the look. 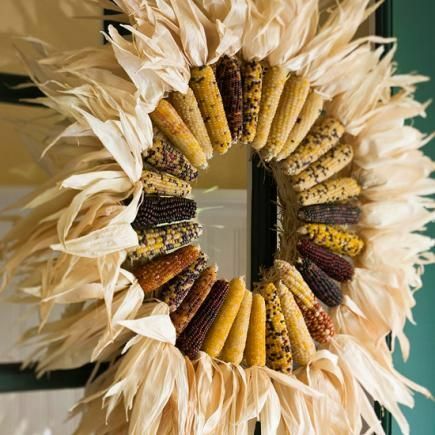 Create this beautiful fall wreath with a variety of materials that reflect autumn’s hues: gold, red, orange and brown. 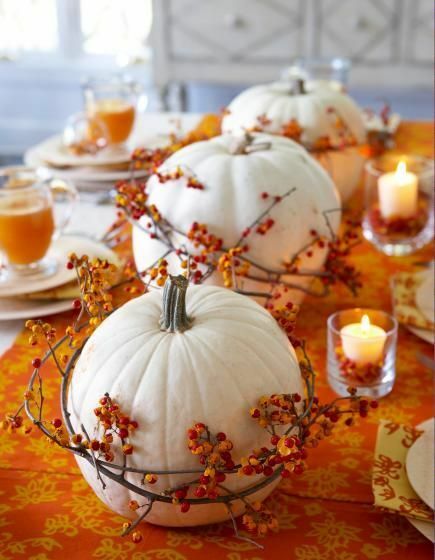 Use as many gourds as you’d like to create this simple mantel decoration. We mixed two larger hard-shell gourds with smaller soft-shell gourds (and tucked in a squash for good measure). Bittersweet branches and maple leaves provide extra color and texture. 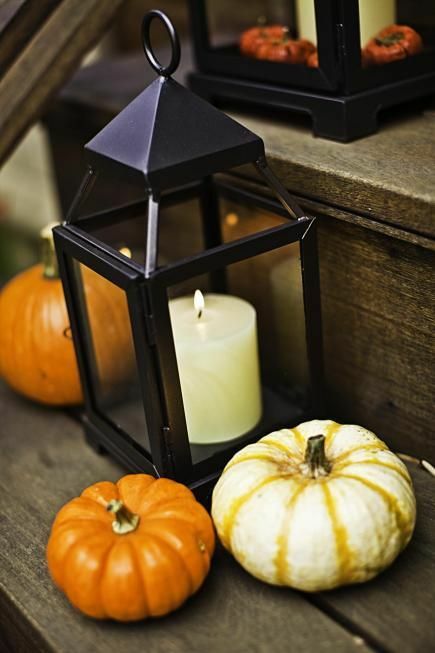 Create a welcoming fall scene with personalized pumpkins. 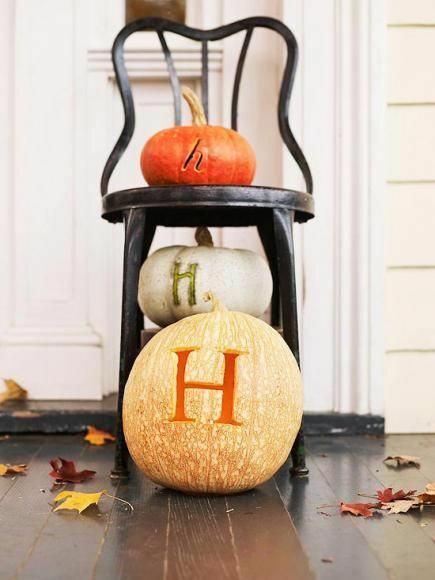 Etch your monogram into small, medium and large pumpkins, using different fonts and styles. 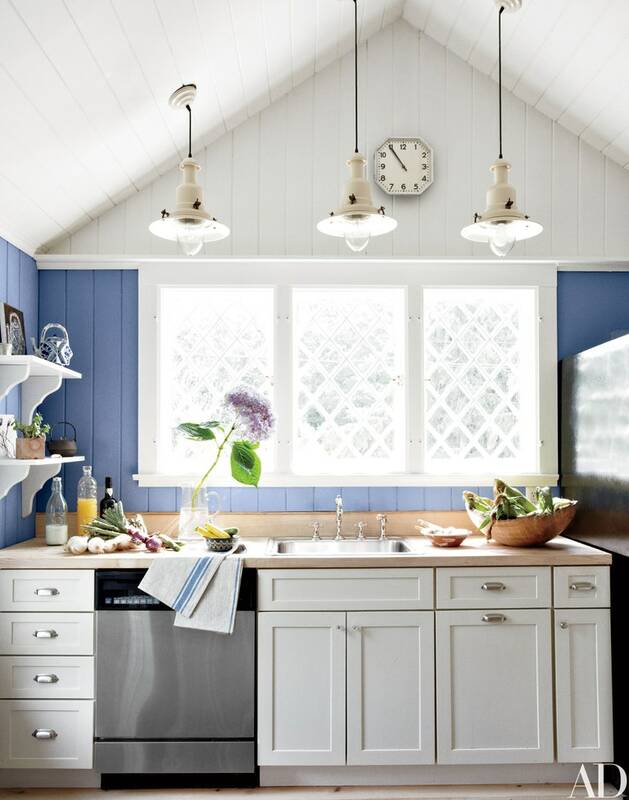 (You can get a similar look with paint if you’d prefer not to etch.) 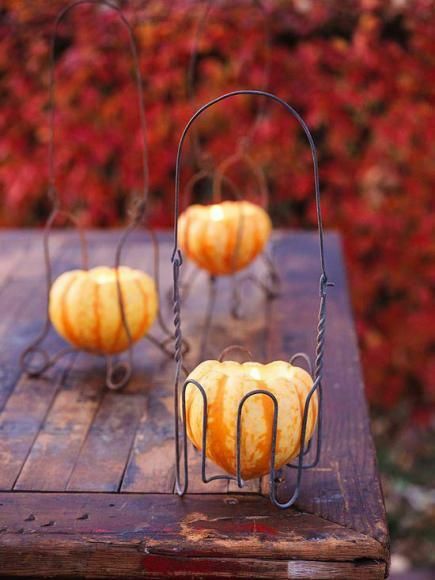 Show off your pumpkins on an old chair or stool. 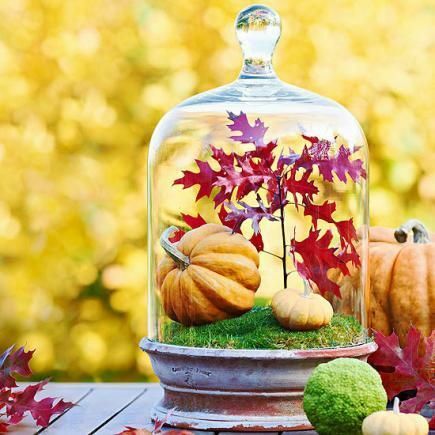 Clear glass containers highlight the seasonal beauty of smooth pumpkins and frilly flowers in this unusual–and ultra quick–display. 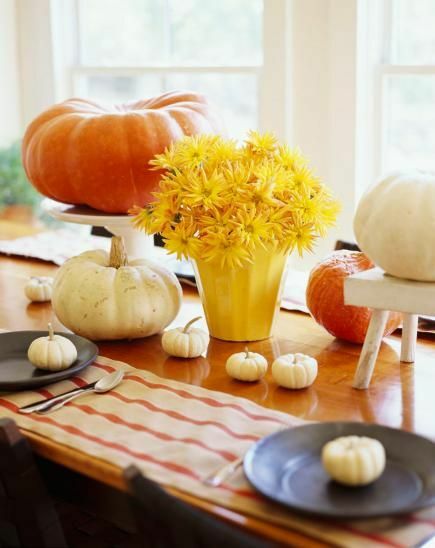 White gourds look like miniature sculptures when placed on pieces of old table legs and balusters. Other items to try as pedestals: upside-down bowls, old candlesticks, decorative nesting boxes, Mason jars–use your imagination!